ProFlowers and Sun Valley Floral Farms Partner to Donate Flowers to Veterans | FTD Companies, Inc.
SAN DIEGO, May 25, 2017 /PRNewswire/ -- To honor the brave men and women who have served our country, leading online floral gifting brand ProFlowers® (NASDAQ:FTD) and Sun Valley Floral Farms will donate and deliver 90,000 Royal Lilies to charities, veteran's hospitals and centers around the nation. Random Acts of Flowers, ProFlowers charity partner whose ongoing mission is to create moments of kindness in healthcare facilities, will deliver the beautiful, bright bouquets throughout the third and fourth weeks of May in honor of Military Appreciation Month and Memorial Day. Lilies represent appreciation, and Sun Valley's Royal Spring lilies are an exclusive hybrid species of Asiatic-Longiflorum Lilies. Their blooms are bigger than traditional Asiatic Lilies, they have the longest vase life of any lily, and they boast the widest variety of colors including wonderful hues of peach, pink, orange and yellow. ProFlowers, Sun Valley and Random Acts of Flowers wanted to honor hospitalized and disabled military members who have served our country with the fresh flowers. Since 1998, ProFlowers works directly with top-quality growers such as Sun Valley to deliver fresh flowers at a great value right to your recipient's doorstep. Sun Valley is one of the largest grower/distributors of specialty cut flowers in the United States with farms in Northern and Southern California. Random Acts of Flowers is ProFlowers main charity partner. To date, ProFlowers has donated more than 38,000 bouquets -- 460,000 flowers -- to the organization for its ongoing mission. 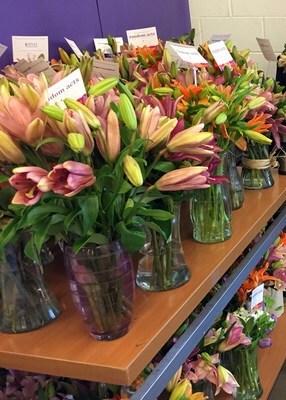 "At ProFlowers, our mission is to inspire, support and delight people through the gifting of fresh, beautiful flowers, while also doing our part to support the communities in which we live and operate," said ProFlowers General Manager and Senior Vice President Laura Szeliga. "Honoring the lives, courage and legacy of our military is a part of that, and we know how much a simple gesture such as a vase of bright flowers can make a really meaningful impact. It goes a long way." "It is through ProFlowers and all of our partners' continued support that brings our mission of delivering hope alive, day in and day out," said Random Acts of Flowers National Programs and Strategic Growth Director Kellie Doyle. "We are also especially grateful to Sun Valley for these beautiful lilies. It will bring so many smiles to veterans across the country." Sun Valley Floral Farms President Lane DeVries said, "It is an honor to participate in this program and share our flowers with veterans across the United States. The men and women who selflessly serve in our nation's military deserve our admiration. We are humbled by their service and see this small gesture as a way to say thank you." ProFlowers offers deep discounts to men and women in uniform at www.proflowers.com/militarydiscount. Visit ProFlowers.com for super-premium quality flowers for any kind of occasion including birthdays, anniversaries and "just because."